Oh my gosh! 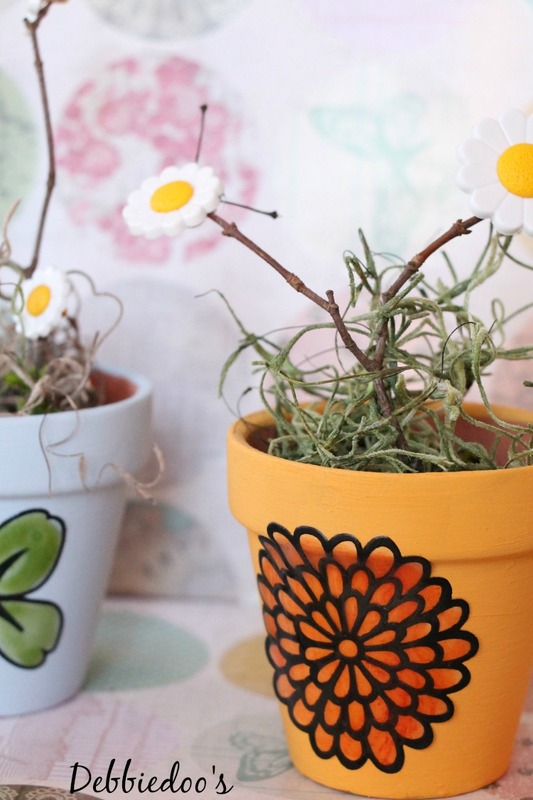 these mini Terracotta pots are just adorable. I found these mini Terracotta pots at the dollar tree. You may have seen them when I shared the house that Jack built. I knew exactly what I wanted to do with these for Spring. First thing I did was bust out my chalky-paint stash. I have every color and want to be able to test out as many as possible. 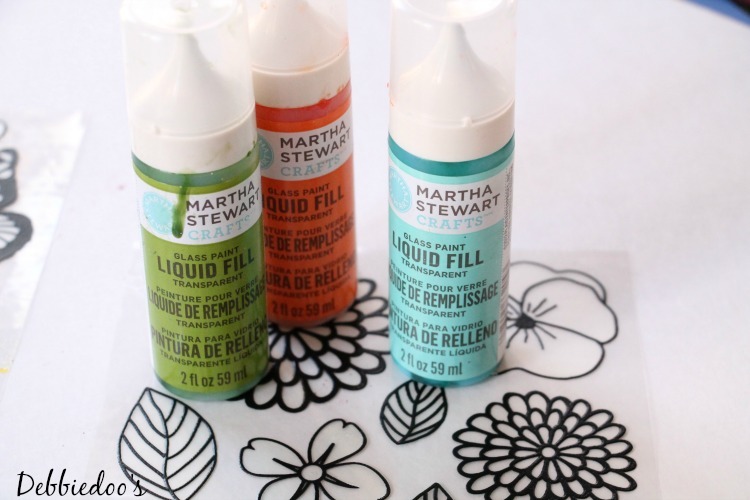 I also have left over these liquid fill cling on’s by Martha Stewart from a project I shared last year. 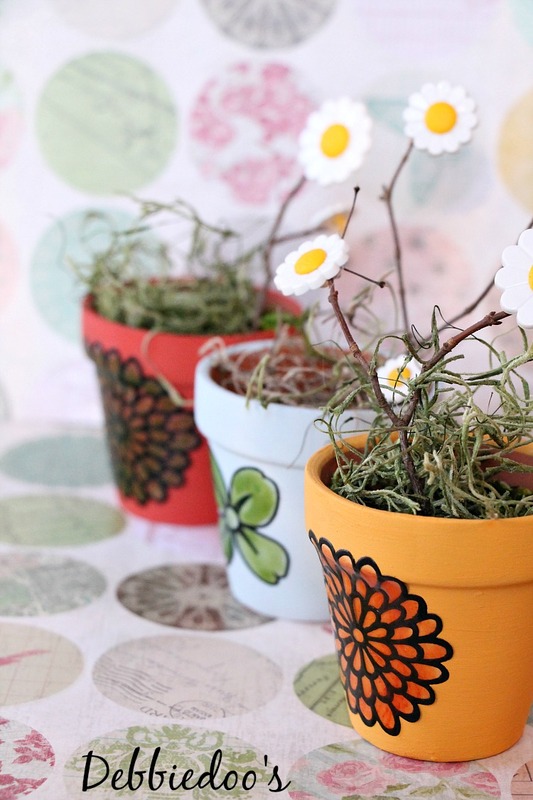 Keep in mind, you can just paint these mini pots or simply sharpie doodle them if you want. Leave them plain too, but cute them up with something simple inside. I thought these Martha clings would look cute on the pots. My little flowers are buttons, hot glued on some sticks from the yard. Filled the pots with some moss also found at the dollar tree. I don’t think these could be any cuter if I tried. Start of my pallet Shelf for Spring. That’s about it. The pots come in a 3 pack for a buck! Thanks for stopping by today. Hope you follow me around. I love to have ya! 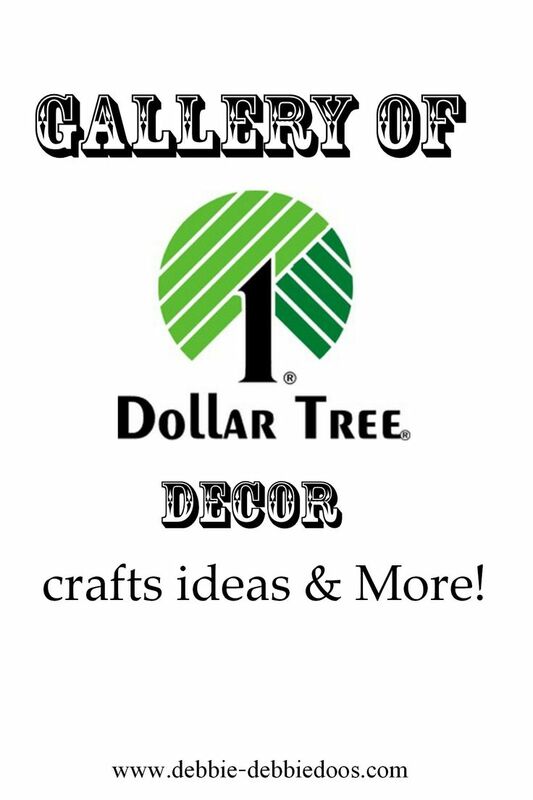 Check out my Dollar tree gallery while you are here. Those look absolutely adorable! Nice job! Hi Debbie Dear! Oh, these are just darling! You’re just terrific! I need to do this and thanks for sharing with us. they are so cute, they have a 70’s vibe going on, great buy too!! Really cute Deb, I thought the flowers were real until I read about the buttons! 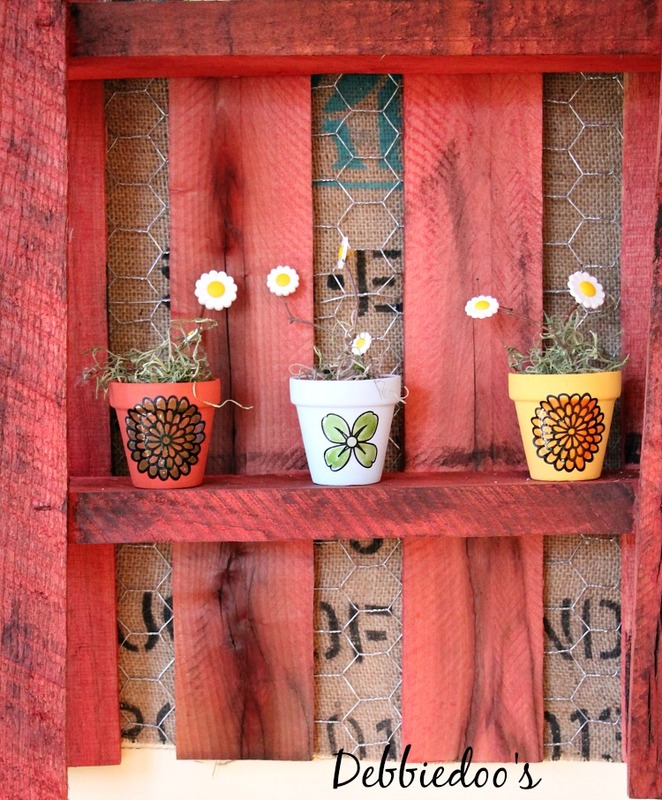 Your pallet shelf looks so cute for spring with the adorable flower pots. Cute project, Debbie! I just picked up some of these from the dollar store. I white washed mine to put in a vignette. Gotta love the dollar store! They could definitely NOT be any cuter! Super cute Debbie! Love the daisies!! 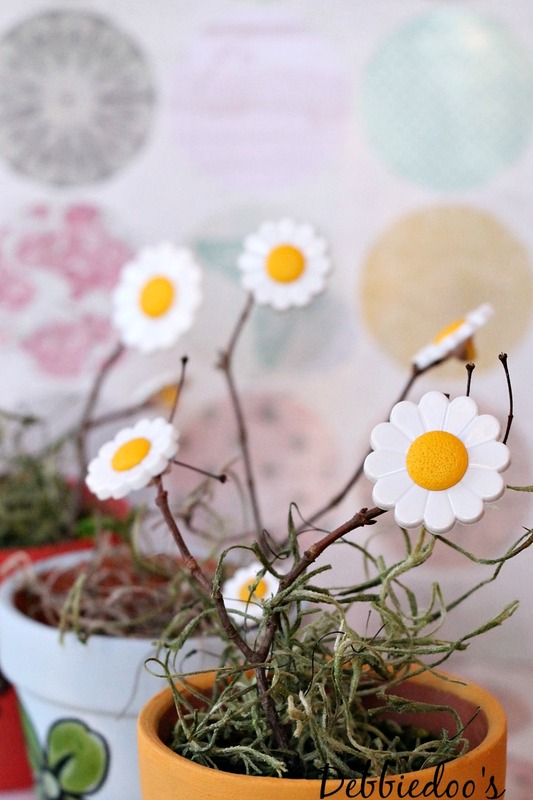 So cute Debbie … love the daisy flowers and they look great on your old pallet shelf. You are sure getting your monies worth out of that shelf. It always looks so good with everything you display on it. 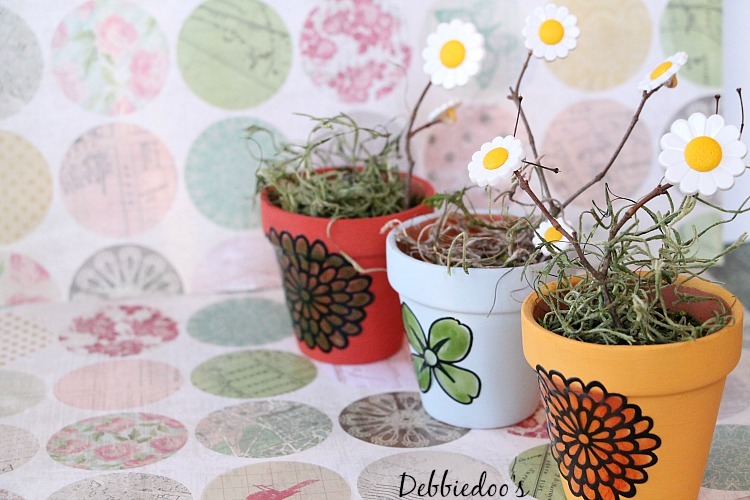 I love seeing what people do with Dollar Tree finds, Debbie! Your pots are so cute! So, so cute . . . just like all of your fabulous “Dollar Store” projects!!! So cute Debbie – and I LOVE those button flowers on the real sticks. Gotta remember that one! 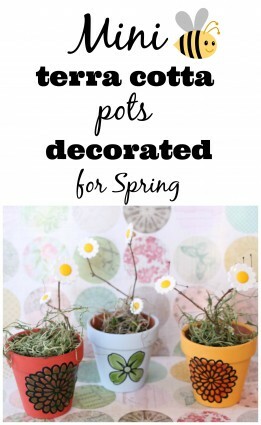 The terracoatta pots are fantastic after it is painted and it is looking awesome. Thanks for sharing. What a pretty idea! Love the flower buttons. You are the best! Thank you for sharing! Love them. They came out adorable!!! Another Great Project. Slow down and Enjoy Life !! So cute, Debbie! You are too clever to use buttons for the flowers! You’re pots are so cute. Debbie when r u going to do another home tour? I’m so missing them. Thank you for all your awesome posts!! Debbie, these are so cute and look how good your photos are. Well done! They ARE the cutest! And they look just right on the pallet shelf. You’re right Debbie! They can’t be any cuter! Love them!